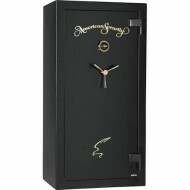 This Gardall Gun Safe has an 18 gun capacity and a 55 minute fire rating. 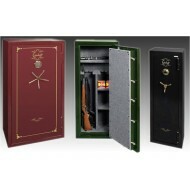 You can choose to store 9 long guns and other valuables. You can choose to use your un safe strictly for long guns using its full 18-gun capacity. The 55 minute fire rating means the safe was exposed to a fire of 1200F for 55 minutes and there was no damage to the contents. You have three options for gloss color: Black, Maroon or Hunter Green. 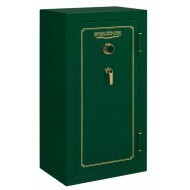 This safe comes standard with a LaGuard Group II combination lock. You can chose to upgrade to an S & G electronic lock. An electronic lock makes access easier and faster. Your new 24-gun Stack On gun safe comes with several important ratings. 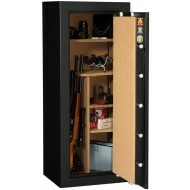 It is approved by the California Department of Justice for secure firearm storage. In addition it has an ETL fire rating. 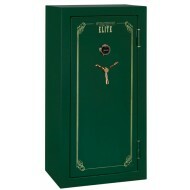 It's high security features also include 5 live locking bolts, 3 dead bolts and a drill resistant door and lock. 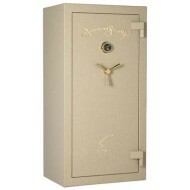 Behind the combination lock is a solid still plate which makes the safe highly drill resistant. You can store up to 24 guns, but if you prefer you can store less and add shelves up the side for small items. The interior configuration is entirely up to you! 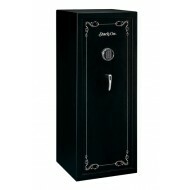 This electronic gun safe is a California DOJ-approved firearms safety device. A California approved firearms safety device rating means that an electronic gun safe meets the requirements of California Penal Code Section 12088 and the regulations issued thereunder. The electronic lock includes a drill resistant, hardened steel plate behind the lock for greater security. A trouble key is included. Batteries are accessible from the front of the safe and are easy to replace so you will never be locked out of your electronic gun safe..